At the entrance to the village of Ballinspittle in Co Cork stands a plaster effigy of the Blessed Virgin which reputable sources agree has not moved for the past 30 years (at least). For decades she’s been frozen there, mutely testifying to the past for posterity, and every so often we take a good look at her to remind ourselves of who we were. Meanwhile, about 75 miles northwest of Ballinspittle, there’s another silent vestige from the Year of Moving Statues, also subject to renewed scrutiny this week with the release of the 1985 state papers. It’s now more than 30 years since Joanne Hayes unwittingly and unwillingly became an emblem of everything that was wrong with 1980s Ireland, and all these decades later, she still can’t move on. We keep looking at her, to remind ourselves of who we were. Hayes was never convicted of any crime – though not for want of trying. For those who weren’t born then (and congratulations on turning 30) the story in summary was this: Hayes was a single mother having an affair with a married man – crime enough in those days – and on 12 April 1984 she gave birth to a child at her family farm at Abbeydorney, who did not survive. 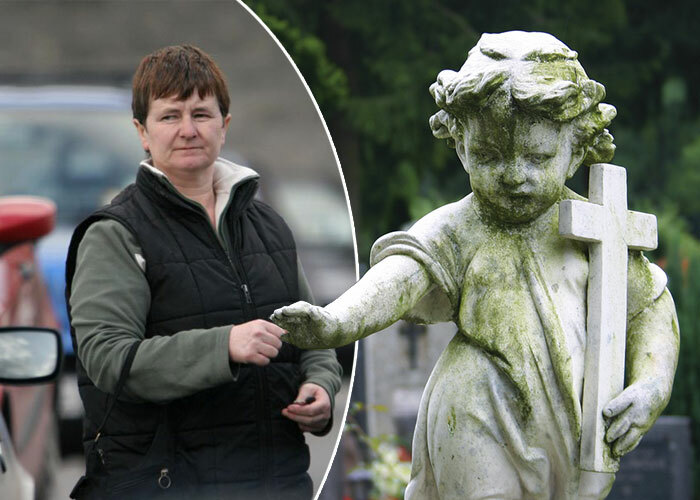 However, the gardaí were determined to pin on her the murder of another newborn found at Trá Bán in Cahirciveen two days later. They were not put off by the fact that the Cahirciveen baby’s blood type was different to that of Hayes and her lover, Jeremiah Locke. They surmised that Hayes had had twins by different fathers in a rare case of heteropaternal superfecundation; they even postulated a non-existent third baby at one point. Eventually, with the scientific evidence stacking up, the state dropped the murder charge in October. Hayes and her family had confessed to some part in the killing of the Cahirciveen baby, statements they claimed were extracted under duress, so justice minister Michael Noonan established a tribunal to investigate, which led to public outcry and picketing. Hayes was subjected to aggressive, intrusive questioning and she was found to have done her own baby to death, although there was not the medical evidence to support this. The gardaí, meanwhile, were more or less exonerated. The Kerry Babies affair was a watershed in the history of Irish jurisprudence and of Irish feminism. Because of it, Joanne Hayes, who stands four feet eight-and-three-quarter inches in her bare feet, became a towering symbol of a society at a turning point. On Wednesday morning, as newspapers and broadcasters began poring over the Kerry Babies case yet again, did anyone spare a thought for the tiny 56-year-old Kerry woman who has now spent more than half of her life in a desperate and evidently futile pursuit of obscurity? My own sympathies were clearly kindled warmly enough to burn off any sense of irony. When feeling troubled about extensive media coverage of the private life of a private citizen, the best course is not to contribute another half-page to it. Hypocrisy aside though, arguments for privacy do sometimes have to be made in public. The Kerry Babies affair is pored over publicly time and time again, not least because Gerry O’Carroll, erstwhile Murder Squad detective and latter-day media darling, still believes Hayes gave birth to the Cahirciveen baby, and rarely misses an opportunity to say so. In his Evening Herald column last year, for instance, he wrote: “I am convinced that Ms Hayes did give birth to twins and was the mother of both the Tralee and the Cahirciveen babies.” O’Carroll seems to have abandoned the outlandish superfecundation theory and has now decided there must have been a slip-up with the blood samples instead, but he’s not letting it go. Joanne Hayes, by contrast, doesn’t do media. She appeared on the Late Late Show in 1985 to talk about her book, ‘My Story’, in which she wrote: “My life has become public property and my body a subject for discussion all over the world.” Since then she has not given interviews and even her book is no longer in circulation, because the gardaí whom she accused of mistreatment – including O’Carroll – secured a record out-of-court libel settlement against the publisher, Brandon Books, in 1987. One of the planned films loosely based on the Kerry Babies affair – ‘Out of Innocence’, starring Fiona Shaw and directed by Danny Hiller – is now in post-production, so there is little hope of privacy for Hayes in the foreseeable future. But consider this: if she had killed her baby – even if she had defied the laws of science by giving birth to two unrelated babies and killing them both – she would have done her time and got on with her life long before this. Her mistake was to make history, and it’s a mistake she’ll never live down.